“Where’s the cake, where are the cookies?” you ask. “I only see muffins.” Though there are only photos of muffins here, because I had only enough for one batch, (otherwise I would have made three batches: muffins, cookies, and cake, for the pure sake of getting photos), and I chose to make muffins. Like I may have said before somewhere in another post previously, now that school’s back – some of us are just starting, others as much as two weeks ago – I’m thinking more of easy, smaller, portable things to make, suitable for packing – whether you’re a lunch box or containers kind of person or brown paper bag kind of person – and possibly quick to make as well, or if not, can be easily made ahead of time. And these muffins – or cookies or cake – are the ticket. I remember this recipe as being one of the first we started making when my family and I were new on the SCD. Nut butter is one of the first things to use in baking in the early stages of SCD; if I’m remembering correctly, nut butters are gentler on the gut than ground nuts or nut flour, which is more advanced. Personally, sometimes I find nut butter a little easier to use and work with than nut flours depending on what you’re making. For example, I’ve found pumpkin puree and almond flour, mixed together in a batter, don’t really go well together in terms of texture (it becomes granular) unless I use coconut milk to round and smooth it out such as with this cake, whereas I have no problem of that sort with nut butter and pumpkin. Adopt a GF Blogger Last week I adopted my dear friend Amy of Simply Sugar and Gluten Free, making her mushroom fritatta, which everyone loved. I was also adopted, by Maggie of She Let Them Eat Cake. She and her two little ones enjoyed the mango banana popsicles. Her post completely made my day as have everyone’s lovely comments. 🙂 Thank you. Shirley posted the round-up today, and it just made my heart giddy reading her commentary about me adopting Amy. Thank you, Shirley, for your lovely words and for reminding me about that SCD page of mine – I’ll need to work on it some more and update it! RSS I know that many of you read Z’s Cup of Tea through the free email subscription. For those of you who prefer to keep track through RSS (or both), you can now subscribe to a new feed that I set up with Feedburner. (I’ll be putting it in the sidebar soon.) You can read it on whatever you’re using, whether it’s on your computer or a laptop, or a mobile device, etc., no matter what format of RSS is supported on your device. There used to be WordPress.com’s RSS feed but lately, it’s all scrambled – just more reason to use Feedburner. It’s been nearly a year since launching this blog, and I still haven’t learned yet to cook pumpkin, so I am relying again, like last year’s pumpkin recipes, with canned pumpkin. Make sure it is a hundred per cent or pure, unsweetened pumpkin puree you’re using – not pumpkin pie filling. 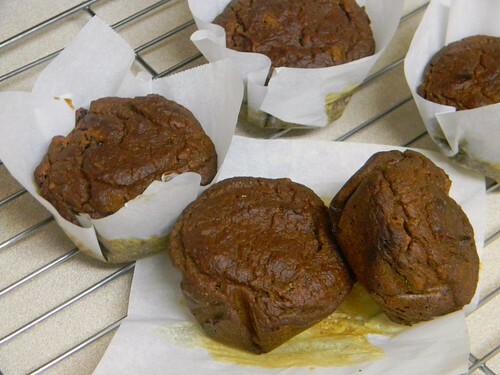 The muffins in the photos I made with almond butter. Although either almond or cashew butter is fine, for these I generally prefer using cashew butter if possible as I think there’s better pumpkin flavour and also the muffins are lighter in colour, more orangey, when made with cashew butter than almond. Preheat oven to 375ºF. If making muffins, line a standard muffin tin with paper cupcake liners. (For the parchment paper liners seen in the photos, see below at the end of the recipe.) If making cookies, line a baking sheet or cookie sheet with parchment paper. If making cake, line an 8″ or 9″ regular or springform cake pan with parchment paper. Food processor: Mix all the ingredients together in a food processor until smooth. By hand: Mix the nut butter and pumpkin in a bowl, add the egg(s) and honey; mix well. Add the baking soda, cinnamon, nutmeg, and vanilla (if using). Mix in the currants or raisins, if using. 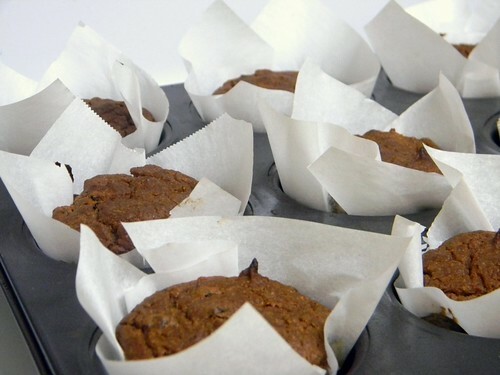 Muffins: Fill the prepared muffin cups halfway with batter and bake for 15 minutes until lightly browned (depending on the nut butter used, the muffins may take on a lighter or darker appearance); an extra 5 minutes may be required. When done, the muffins should spring back when gently touched. Cool in muffin tin or on a wire rack. Cookies: Spoon small amounts, about a tablespoon, of the batter onto the prepared baking sheet, spacing 2 inches apart. Bake 15 minutes until lightly browned. Cool on baking sheet or a wire rack. Cake: Pour batter into prepared cake pan and spread evenly. Bake for 30 minutes, until top springs back when touched or a toothpick comes out clean from the centre. 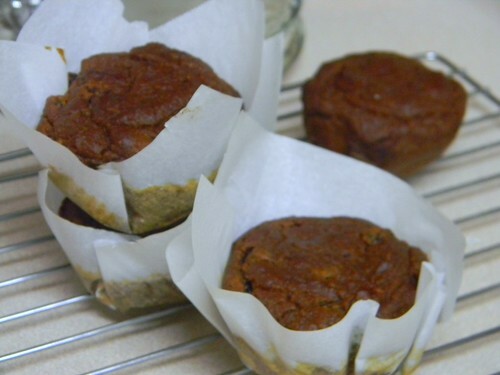 For the parchment paper liners, cut five-inch square pieces of parchment paper and place one square into one of the muffin cups, pressing along the folds to crease them as best you can. Repeat with the rest of the parchment paper squares. I ran out of cupcake liners, would you believe it, so I used this parchment paper liner idea that I got from Martha Stewart via Apartment Therapy. Truth be told, I don’t think all the pieces I cut were exactly five inches but they still worked. If you’re afraid of the excess parchment paper getting singed or burnt, trim the edges before baking. Zoe, I’m so pleased that you enjoyed my post and summary of your adoption of Amy so much! I just spoke from the heart. I love these connections we make online. They are to be treasured. A couple of things on this post … I adore pumpkin ANYTHING! Best flavor ever in my opinion. (Probably better than chocolate! Yes. LOL) Yes, I can see the swans. 😉 I’ve never heard of the parchment idea, but cute. I usually just grease the muffin tin and go with that. Apartment Therapy is a cool site. I was just reading that the wife of the fellow who developed that site is a famous recipe developer. Think I got that right (from Dianne Jacob’s site). And, finally, thanks for talking about nut butter vs nut flour. I did try pumpkin with almond flour for pumpkin bars last year and got a tasty crust like concoction, but not bars. Now I know! … thanks so much for this whole post, Zoe! Thanks, Shirley! I will keep that in mind about you and pumpkin. 😉 Perhaps that’s why it goes together so well with chocolate – the best of both worlds, right? Chocolate chips would work perfectly in place of currants in this recipe. I’ve never baked muffins without lining the tins as our muffin tins are non-stick and my family and myself prefers to not to use non-stick – all our cookware is stainless steel, for as long as we’ve been helping my brother and since we found out about heavy metal poisoning. (Aluminum can leach from non-stick and be absorbed by the food.) When heated, non-stick can also release toxic fumes that can be lethal to pet birds – my sister has two budgies. When I come into possession of a cast iron or glass muffin tin, I will try just greasing them and putting the batter in directly. Finding bakeware such as muffin tins, cake pans, etc. (the stuff generally purposed for baked goods) that aren’t non-stick requires a bit more searching; it’s almost hit and miss. Yummy and oh so pretty! What did you use to line the muffin tin with? Those muffins look amazing! I’m with you. Anything easy to grab and take with you is imminent once the semester begins. And out of cake, cookies and muffins, I think I’d choose muffins anyway! I’ve never tried cooking with nut butters before. It’s definitely something I’m going to have to try really soon. Hi Miel, thank you! Nut butters are very easy; in my experience, nut butters are the easiest to work with out of all gluten-free baking. And yes, I agree about things that are easy for “grab and go”; I will be sharing more recipes like this as we advance further into September. I’ve no idea what the nail colour is called, I only know that it’s OPI! I only have it in a mini bottle. Yay Zoe! These look delightful! And I love the nail colour 🙂 I just made some pumpkin muffins this morning from the Babycakes cookbook. They were yummy but I wish I had seen yours first! Thanks for mentioning the adoption. I had fun! I hope school goes well this year! Hi, Maggie! I’ve looked at the Babycakes cookbook once in a bookstore, and was charmed by the bakery’s philosophy. I also liked how the different gluten-free flours used were described and explained right away, especially the differences between white and brown rice flours (not much luck finding an explanation of differences on the Internet). You’re most welcome about the adoption mention – it was fun! Thank you for the school wishes. As for the nail colour, it’s OPI but I have no idea what it’s called; the mini bottle that I have (given to me by my aunt) wasn’t labeled. I thought it was black, but sometimes it seems more like a dark purple and there’s a subtle sparkle that only shows in sunlight. These look AMAZING. I really need them. Like…right now. Hi Kaitlin, thanks! The parchment paper liners are very easy to do. When I line pans with parchment paper, I’m still far from perfect, though. Believe it or not, I’m always looking at different guides, mostly online, on how to line pans with parchment paper “properly”. These were FANTASTIC as “muffins”, though we thought they seemed to be more of a cupcake than a muffin. I took these to a “mini-Thanksgiving” at a friend’s house on Sunday. I frosted some of them with Whipped Cashew Cream from Eat Well Feel Well and it was like having frosted cupcakes. YUM! I already had 2 cups of pumpkin puree measured and in the food processor because I was going to make pumpkin pie – but then decided 4 pies in 2 weeks was enough, so I went looking for “something else” to do with pumpkin. Elana’s pumpkin bars are pretty good, but I already took those to a party 2 weeks ago. When I found this recipe, I decided to make pumpkin cookies. And I’d make a double batch since I already had 2 cups of pumpkin ready to go. But when it was mixed up, the batter seemed too runny to be cookies and I was in a hurry and didn’t want to fiddle with adding more almond butter or eggs to get it thicker, so I just went with muffins/cupcakes. I’m so glad that I did so that I could frost some of them and we could pretend we were eating bad-for-us cupcakes. I accidentally added ginger to mine, which of course worked out great. I got to used to measuring spices for pumpkin pie, so when I saw cinnamon & nutmeg, my brain added ginger to the list. I dumped it in with the other ingredients before checking the recipe and seeing ginger wasn’t in the list. Ooops! I also didn’t have a ton of honey on hand, so I only used 1/2 cup for the double batch, and it was perfect. I think we’ve gotten used to eating less sweet stuff (we follow the SCD). 1 cup almond butter, 2 eggs, 1/2 cup honey, 1/2 cup raisins, double all your other ingredients + 1 teas ground ginger. I’m curious what you add more of to get the batter thicker to be able to make cookies out of this – more nut butter or more egg? I assume that’s what you change since it’s a 3-way recipe and you give ranges for those 2 ingredients. Thanks so much for this recipe! Even the non-SCDers at the dinner loved these and wanted the recipe. I used pureed butternut squash instead of pumpkin because we had some leftover. They turned out great. I used about 3/4 C almond flour and less honey. It only made about two dozen so I will definitely be making these again soon. Thanks for posting!